Tungurahua, one of Ecuador's "big three" volcanoes, once again ramped up its eruption late Wednesday, triggering emergency evacuations. The evacuations came too late for some villagers living high on the volcano's slopes, however: At least five people were killed, many have been injured, and at least another 60 people are missing from villages that were destroyed by the eruption, according to Agence France Presse. Tungurahua volcano in Ecuador has been erupting since 1999, but its activity has increased in the past couple of days. Ash has reached 15 kilometers (50,000 feet) in the atmosphere, as it has traveled both eastward and westward, according to the Washington Volcanic Ash Advisory Center (VAAC). Image is courtesy of the National Oceanic and Atmospheric Administration. The current eruption, which intensified back in July and then quieted some until this week, has expelled blocks of hot, glowing rocks and ash more than 100 meters down the slope, according to the Smithsonian's Global Volcanism Program's weekly report. 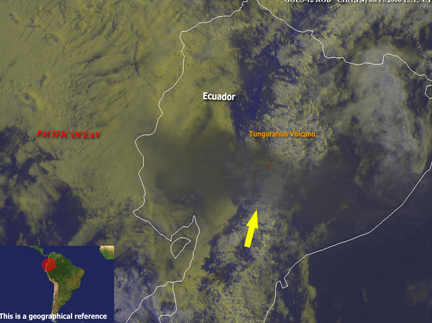 It also sent an ash and gas column about 15 kilometers (50,000 feet) into the air, prompting the National Oceanic and Atmospheric Administration's (NOAA) Washington Volcanic Ash Advisory Center (VAAC) in Maryland to issue a warning to any airplanes flying near or into Quito, Ecuador, says Brian Hughes, an analyst at VAAC. Quito, Ecuador's capital, is about 140 kilometers north of Tungurahua. Officials at VAAC, one of nine regional centers that watch for volcanic eruptions and issue ash advisories to the aviation community, says that ash is reaching 11 to15 kilometers (35,000 to 50,000 feet) as the plume moves both eastward and westward. Ash is sometimes even more dangerous to aircraft than to people on the ground, endangering the lives of passengers, crew and the airplanes themselves (see Geotimes, October 2004). Roughly 300 flights pass over active Ecuadorian volcanoes daily, carrying more than 10,000 passengers and millions of dollars in cargo. 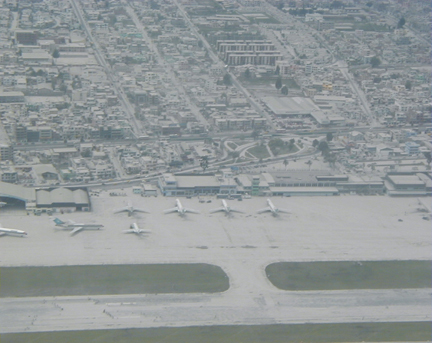 In 1999, an eruption of Guagua Pichincha volcano in Ecuador covered the nearby Quito airport with ash. In response to Tungurahua's intense eruption this week, the Washington Volcanic Ash Advisory Center issued a warning to pilots flying over Ecuador. Photo is courtesy of Hugo Yepes, Instituto Geofisico-EPN. The situation on the ground is alarming as well, according to officials quoted by Agence France Presse, who say that at least four villages on the volcano's flanks no longer exist. Officials say that most people were safely evacuated Wednesday from many of the villages on the slopes, just hours before Tungurahua erupted. Some local residents, however, refused to leave. Tungurahua is one of the Western Hemisphere's most active volcanoes, Hughes says. NOAA has been tracking ash from the volcano since 1999, he says, when Tungurahua began sending small ash plumes into the atmosphere in November, with several larger eruptions in late 1999 that sent ash flying more than 9 kilometers (30,000 feet) into the air. Tungurahua has been actively erupting since 1999, after an 80-year period of quiescence, although the volcano has never erupted explosively like Mount St. Helens in Washington or Mayon in the Philippines, he says. Following Tungurahua's increased volcanic activity in mid-July, the United Nations began sending humanitarian assistance, including food, tents for shelter, teaching materials and health assistance, to the government of Ecuador to help with the thousands of people evacuated from high-risk areas. Officials suggest that there is no way to tell when this current eruptive period will end, though the volcano is quieting some: According to Hughes, the ash column is no longer reaching quite as high.